Streamlined, showerproof and stylish, the Original Nylon Tote in bold red is the perfect combination of practicality and flair. Frop laptop to luggage you'll have all the space you need with a total capacity of 18.3L. A concealed front pocket offers safe and easy access for hectic travelling days while the water-resistant exterior protects your stuff from sudden downpours. Rated 5 out of 5 by joana from beautiful! really like it, very pratical and very beautiful. recomend! Rated 5 out of 5 by Birdie from Durable classic I received this bag and found its best use for toting My Grandkids extra diapers wipes and toys when they are out and about with me. Rated 5 out of 5 by Dpjmom from Great travel bag - light weight and roomy I recently used this bag as my carry on bag for a trip. The size is great for personal items. It doubled as a purse when the weather got rainy. The bag also fits easily under the seat when flying. I am very happy with it! Rated 5 out of 5 by Momof2 from Versatile Tote. This tote size is just large enough to make it serve multiple purposes. It came in handy as a fitness gear bag, I also used it to carry a couple of small blankets to my son’s soccer game here in cold Michigan. I think it will work great as a carry-on bag for travel when next we take a trip out of town. I’m sure it will work just as well as a work tote bag. I was expecting a non collapsible bag based on the picture on the website, but it is not, rather it is compressible, which I think will make it more durable on the long run. Rated 5 out of 5 by Sunnydaze from great for traveling & commuting I am always looking for a tote, that can withstand the rainy days of fall. This tote is perfect! I love the size, I fit my small purse inside with folders for work and my ipad. I also just used for a quick weekend get away, fit well under the seat as carry on. wipes clean and yet still looks great with all my outfits. Long enough to wear over my shoulder and yet you can still carry. Very pleased with the versatility of this bag. Would make a great gift for a busy working mom. Rated 5 out of 5 by M195 from Gorgeous and practical Traveling often I am always on the lookout for the perfect tote. Hunter has scored on creating the best tote I have found to date. From a large zipped top to an interior zipped pocket and an abundance of space makes it the best tote ever. 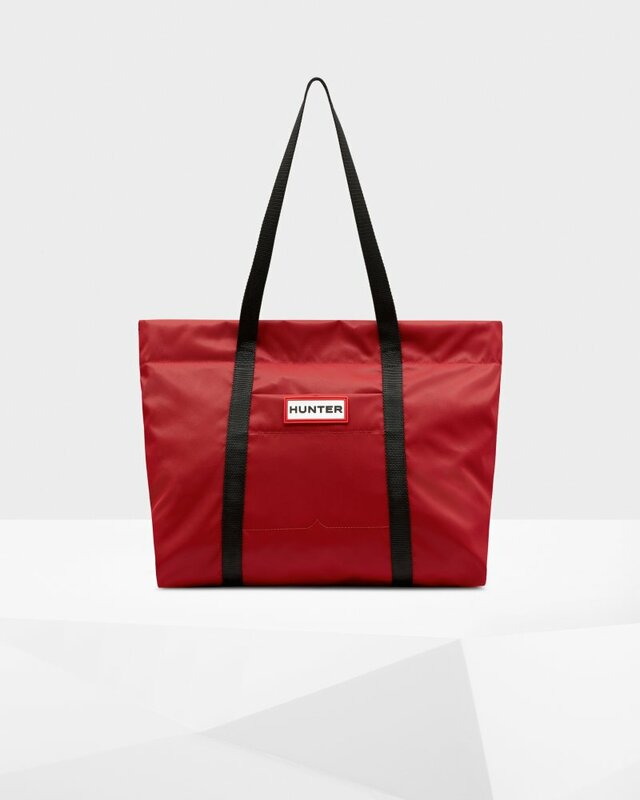 Thank you Hunter for creating such a thoughtful tote. Rated 4 out of 5 by Ana2018 from Durable and cute! I received this bag and I’ve been wearing it ever since! I love the fact that it can be wiped clean! The straps are great length to wear on y shoulder or just to carry in my hand. The bag is also spacious which I also love!